Celeste is a large dark red/black cherry with a small stone and good volume of juicy flesh. The flavour is excellent, very sweet, quite mild, and with a pleasant cherry aftertaste. Probably one of the best early-season cherries. Unusually amongst cherries, Celeste is naturally compact, making it ideal for small gardens and growing in patio containers. We find that even on the semi-vigorous Colt rootstock it will still remain a fairly small tree, typically reaching 2m-3m. Celeste® is a protected variety. 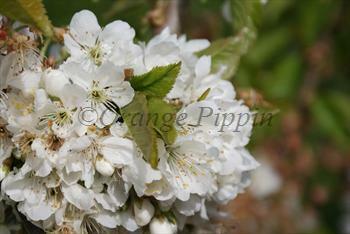 Please fill in the details below and we will let you know when Celeste cherry trees are back in stock. Celeste is in flowering group 2. 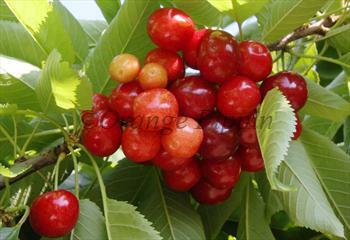 Celeste is self-fertile and does not need a pollination partner, although fruiting may be improved if there is a compatible tree of a different variety nearby. Celeste was developed by the Summerland research station in British Columbia, Canada, and released in 1990.